My baby turned TWO this month! 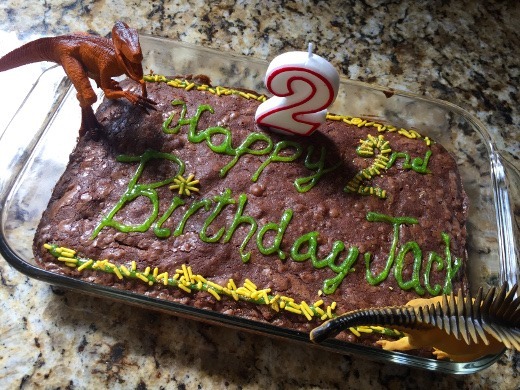 He’s not a big fan of cake or ice cream, so I made brownies instead, and decorated them with dinosaurs. Please don’t make fun of my (lack of) decorating skills. They were made with love and that’s all that matters! The weekend before J’s birthday, we had a low key celebration with my parents. Yay for animal-themed gifts! This dinosaur box was one of J’s two main birthday gifts from the huz and I. 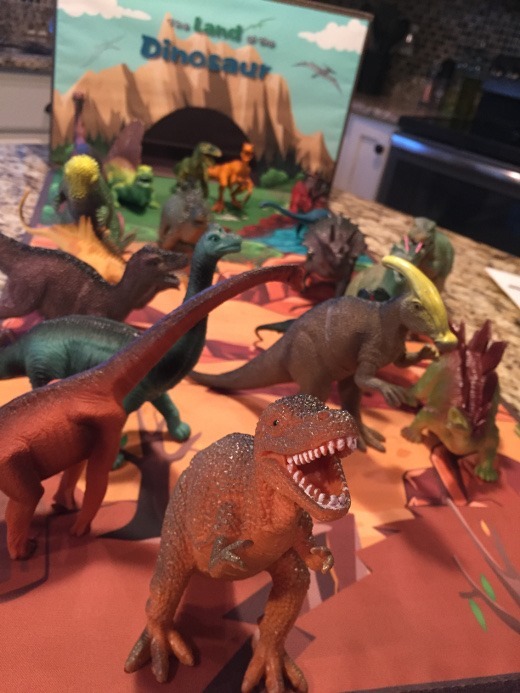 It folds up into a generic brown storage bin (which holds all the dinos) and when unfolded, it turns into a play mat for the dinos. 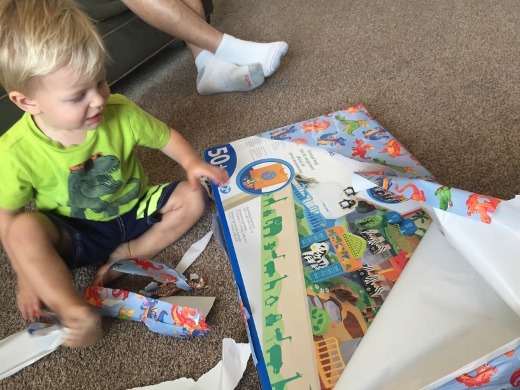 We have an adorable video of him opening the box and discovering all the dinos! He is OBSESSED with dinos! 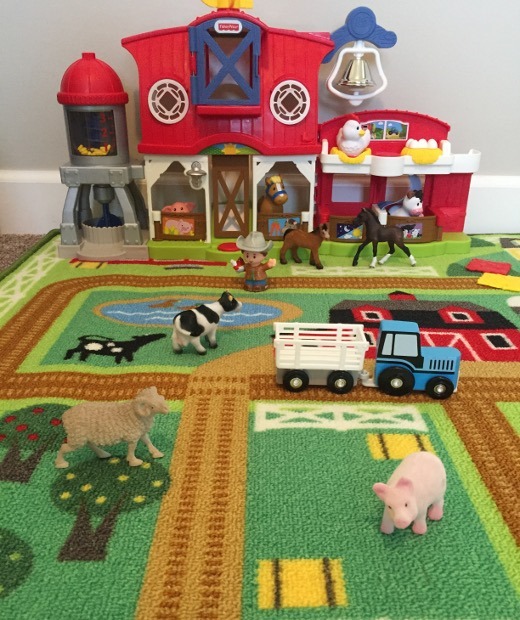 We also got him this Little People Caring for Animals Farm Set and a Melissa & Doug Farm Mat. He loves it! The next weekend was Labor Day weekend, and the three of us went out of town for a long weekend to celebrate J’s birthday. On the way to Grand Rapids, we took a little detour and stopped at Deer Tracks Junction in Cedar Springs, Michigan. 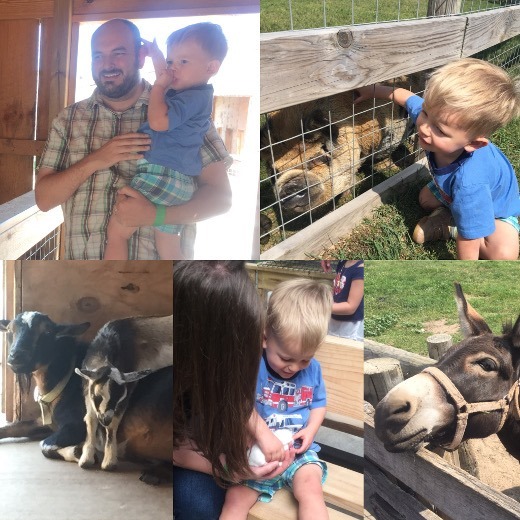 J had a blast visiting all the animals at the petting farm, playing in the big sandbox, seeing the yaks (yak yaks! ), holding a baby bunny, and afterward, we all shared a giant chocolate peanut butter ice cream sundae! For dinner on Friday evening, we took J out for his first Spanish tapas experience at San Chez Bistro in Grand Rapids! Everything was super delicious. J had chicken tenders and fries (both were homemade!) 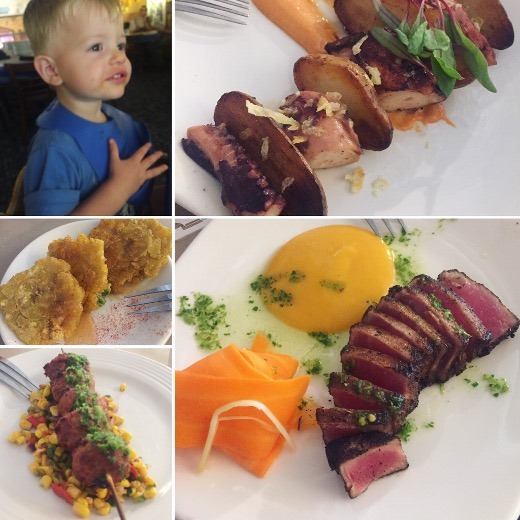 but he also nibbled on all the tapas dishes we ordered, like plantain fritters, chorizo meatballs, braised octopus, and seared tuna. The huz and I each had a happy hour sangria too. On Saturday morning, we headed to D’arts Donut Shop in Eastown, Grand Rapids (just minutes from where we were staying) and picked up a half dozen specialty donuts. We ate them on the spot in the shop (with coffees for mama and dada) and housed all six between the three of us. 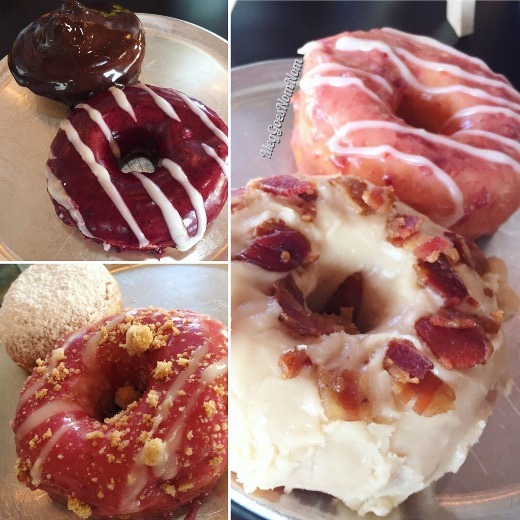 That Whiskey Bacon donut though, you guys – OMG! 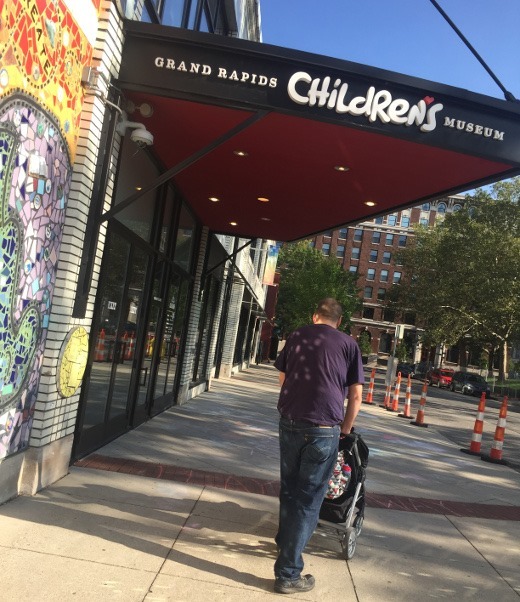 After that, we headed downtown to the Grand Rapids Children’s Museum. All three of us had an absolute blast! 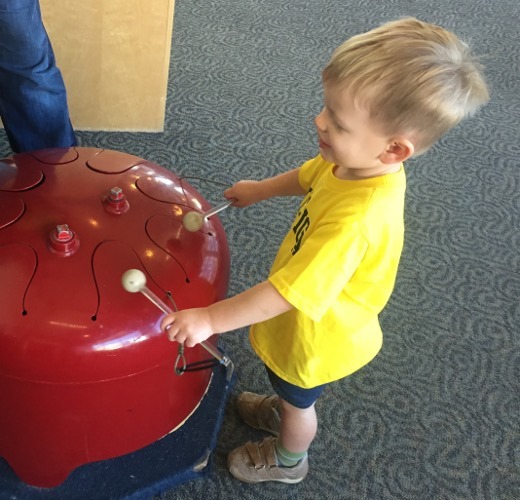 There is SO much for little ones to do here, and even our young two year old could try out almost every exhibit in the place! For dinner, J had a cheeseburger (loved it! ), huz had a fried chicken sandwich, and I had the most incredible pastrami sandwich. Seriously, it was heavenly. One of the best sandwiches ever! I have been craving it ever since. I am now a Brewery Vivant fan! If you can’t tell, our trips are very much All About the Food. We all love to eat immensely! 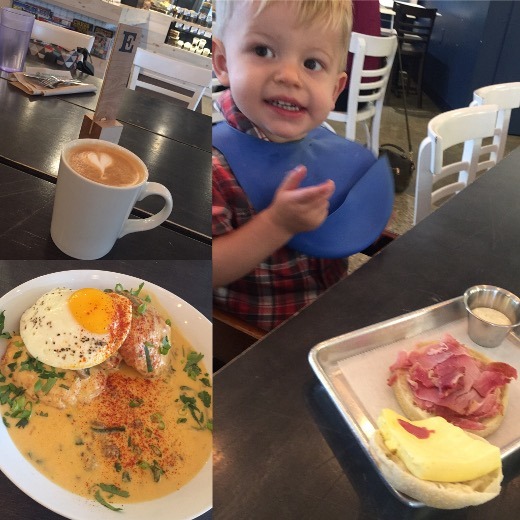 On Sunday morning, we stopped for brunch at That Early Bird in Eastown, Grand Rapids. 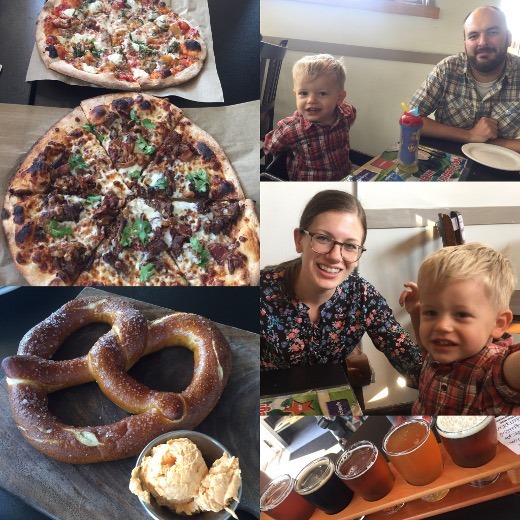 This place was pretty hipster, and also expensive…and I am coming from the Ann Arbor area which is notoriously pricy, so that is saying something), but the food was pretty good and satisfied our hungry bellies. J had a breakfast sandwish with an English muffin, ham, and eggs (the latter of which he adamantly refuses to eat in any form), while the huz and I shared an order of biscuits and gravy, featuring poblanos and chorizo gravy, and a fried egg on top. 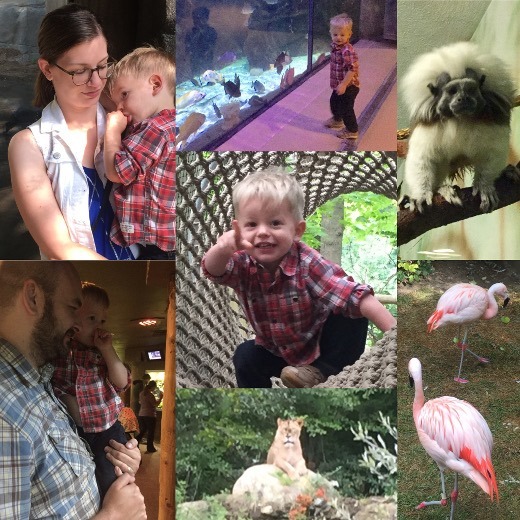 It’s a really nice zoo and we really enjoyed visiting! 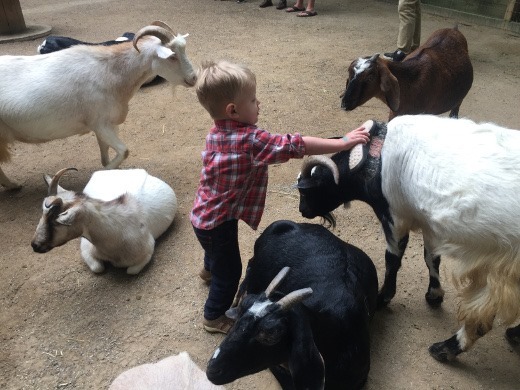 J’s favorite part, by far, was the hands-on area with the goats – he loved brushing their coats with the brushes they had available. It was so adorable – he took the job so seriously! We also had an Aloha Goat pizza with goat cheese, sausage, basil, and charred pineapple. So good! There was another family of three with a toddler around J’s age sitting across from us, and the kiddos checked each other out a few times during the meal. I do wish they’d had some crayons or something to help entertain the little guy, but it was fairly family-friendly. 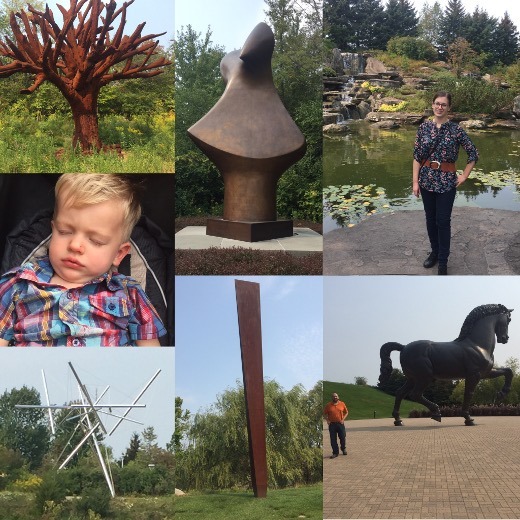 On Monday, we visited the Frederik Meijer Gardens and Sculpture Park. This was the first time any of us have ever visited (though I’ve wanted to for ages) and WOW! It was huge! We were there for over three hours and I feel like we barely scratched the surface. 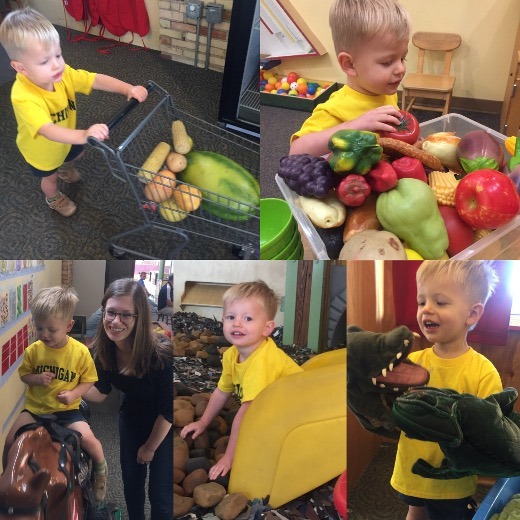 J most enjoyed the Children’s Garden, and there were lots of cool things for him to check out! 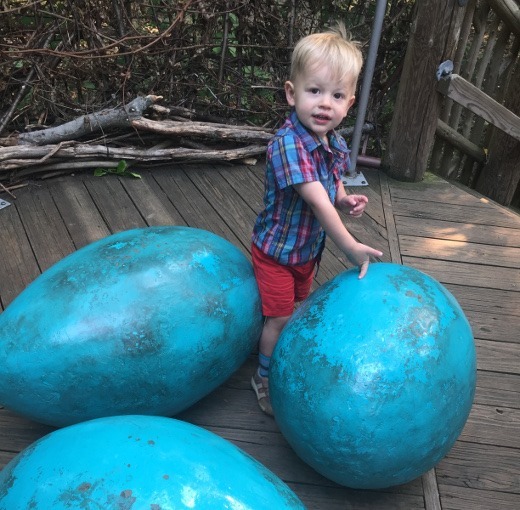 Here he is insisting he had found “dino eggs” and inside are “baby cer-tops” (triceratops). Love this kid! Outside of the Children’s Garden, it was a little difficult covering much ground because he didn’t want to sit in his stroller much, but also didn’t want to walk very far either. Naturally, he wanted mama (and ONLY mama) to carry him. And guys, this kid weighs over 30 lbs now, so carrying him around in 80+ degree weather in the hot sun is pretty exhausting! At one point, we all got super hangry, went inside and cooled off the in the A/C, refueled with lunch at the café, and then charted a new path to the sculpture garden. By late morning, J was getting pretty worn out and was much more amenable to being pushed in the stroller. This gave the huz and I an opportunity to check out the sculpture park for a bit, while J dozed in his stroller. 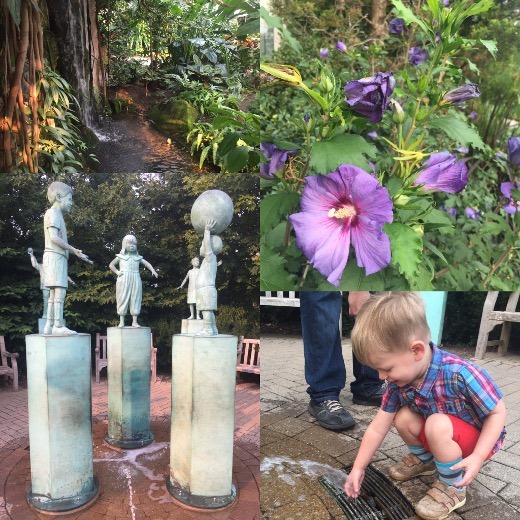 Mid-day, we left the gardens, and headed home (J dozed most of the way.) 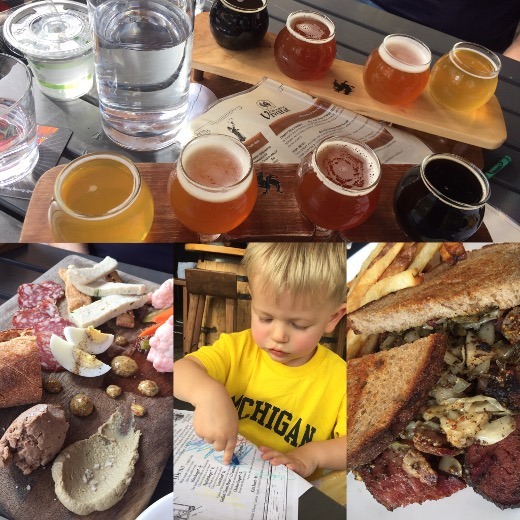 We had such a fun weekend in Grand Rapids – even more of a blast than I had expected. 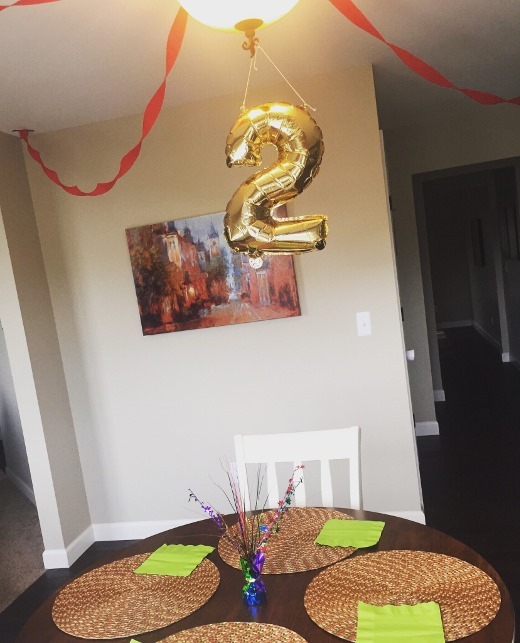 This was an easy-going and fun way to commemorate J’s second birthday and also a nice way to get in one more mini-vacay before summer was over!